FOR IMMEDIATE RELEASE, CAMBRIDGE, MA, December 29, 2014: WorldPath Health and The MOUNT AUBURN HOSPITAL today announce the dedication and naming of THE BASIL AND FARIDA EL-BAZ CENTER FOR MULTIPLE SCLEROSIS AND DEVIC’S DISEASE which took place on Monday, January 29, 2014 at 1:00 PM at 330 Mount Auburn Street, Cambridge, MA 02138. Basil El-Baz, through his generosity, establishes the Center with a gift of $1,000,000. Funds from Mr. EI-Baz’s generous gift will be placed into the Basil and Farida El-Baz Fund for Multiple Sclerosis and Devic’s Disease, a restricted fund to support the Center’s ongoing work. The Center, under the direction of Linda Buchwald, MD, Chief of the Division of Neurology, will support and enhance the work of the hospital’s nationally-recognized Multiple Sclerosis clinical program. The Center includes offices for physicians specializing in MS, Devic’s Disease and related neurological disorders, private patient examination rooms, treatment areas, offices and work areas for nurses and support staff, and a conference room. 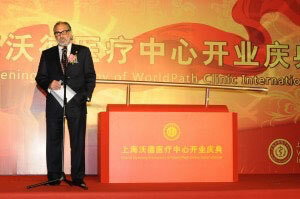 WorldPath Health, Inc. is a premier provider of international health care throughout the world. It is based in Cambridge, MA with offices in New York and London. Basil El-Baz is an Egyptian Industrialist, entrepreneur, business executive, and philanthropist. A Harvard graduate, Mr. El-Baz is Chairman and C.E.O. of Carbon Holdings. He has served as a member of the US-Egyptian Business Council since 2009 and is Chairman of The American Chamber of Commerce in Egypt. MOUNT AUBURN HOSPITAL is a nationally recognized center distinguished by its interdisciplinary center for patients with Multiple Sclerosis and Devic’s Disease. FOR IMMEDIATE RELEASE, CAMBRIDGE, MA, September 15, 2015, 9:45 AM – Guy Rochman, MD, Founder and CEO of WorldPath Health has been invited to Shanghai, China to expand operations there. Dr. Rochman and members of the WorldPath team will travel to Shanghai to pursue expansion of WorldPath operations in China and surrounding areas. In affiliation with the WorldPath Clinic, Dr. Rochman was one of the first US Plastic Surgeons licensed to practice in Shanghai. 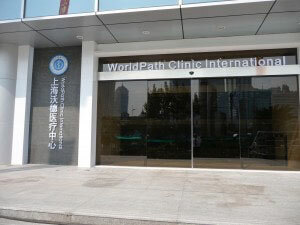 Dr. Rochman led the WorldPath Health team traveling to China and was closely involved in the formation of The WorldPath Clinic International in Shanghai China, which has become an extremely successful international healthcare center bearing the WorldPath name. FOR IMMEDIATE RELEASE, CAMBRIDGE, MA, August 13, 2015, 9:45 AM – Guy M Rochman, MD, Cambridge based Plastic and Reconstructive Surgeon and founder and CEO of WorldPath Health is the first physician in Boston to offer the UltraShape™, a breakthrough treatment recently FDA cleared for Fat Cell Destruction. WorldPath Health is pleased to offer UltraShape Technology to both domestic and international clientele. The UltraShape System is the first and only non-invasive fat reduction treatment that uses ultrasound to immediately and comfortably destroy fat cells, resulting in measurable outcomes in as little as two weeks. The UltraShape device works by emitting waves of focused, pulsed ultrasonic energy that converge at a closely confined area. It precisely targets areas where patients want to reduce stubborn fat while keeping surrounding tissue, nerves, and muscles intact and undamaged. Fat cells are destroyed and eliminated by the body’s natural processes as soon as two weeks after treatment resulting in very visible and immediate reduction. “We are very excited about offering UltraShape to our patients.” says Dr. Rochman, of Mount Auburn Hospital in Cambridge. “UltraShape’s patented technology allows us to delivery ultrasound energy with extraordinary precision. We can target and destroy unwanted fat cells immediately. UltraShape delivers energy in pulses, unlike the continuous delivery method of traditional ultrasound technology, which is often painful. The result is a quick, safe and comfortable treatment experience without the discomfort, lumps, bumps or soreness associated with other non-invasive fat reduction treatments. “Treatments take less than an hour and patients can go right back to their normal activities without any disruption. Nothing works faster than UltraShape,” Dr Rochman adds. The UltraShape is a very versatile device that is effective for the reduction of fat deposits that are resistant to diet and exercise. In one of the largest clinical studies ever performed in the area of non-invasive aesthetics, ninety four percent of patients saw a measurable circumferential reduction using the UltraShape device and 90 percent of patients were satisfied with their treatment outcomes. UltraShape is FDA cleared for fat cell destruction and is used to improve body shape and contour. It has been used in over 300,000 procedures worldwide, with an excellent safety and efficacy profile. For further information about UltraShape contact WorldPath Medicine offices at 1- 617-450-001. This fall, Mount Auburn Hospital, a major WorldPath Heath affiliate institution, completed construction of a redesigned and expanded center for the treatment of cancer and blood disorders. The Hematology/Oncology Department has long been one of the hospital’s cornerstones of excellence and compassionate care. Pioneered under the guidance of Mortimer Greenberg, MD in the 1960’s and later expanded under the leadership of Roger Lange, MD, over the years, thousands of patients have been expertly cared for and compassionately treated by an extraordinary team of physicians, nurses, technicians and staff. 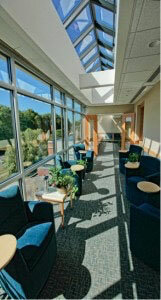 As the treatment modalities for cancer rapidly expand, Mount Auburn Hospital – in partnership with leadership in oncology – developed a plan to further support the special level of care that physicians and nurses provide to patients and their families and to enhance the healing environment. “Our goal is to provide an expanded array of treatment options, personalized to each patient, and to deliver them in an environment that supports our patients’ wellbeing,” says Lisa Weismann, MD, Chief of Hematology/ Oncology. The new center features an attractive, light-filled reception area and solarium overlooking the river designed to create a welcoming area of comfort and greenery for patients and their families. In addition, a Patient Wellness Center was created to provide essential resources for patients and their families such as mind-body medicine, workshops and support groups, integrative therapies, nutrition counseling and education. The new design also provided the opportunity to enhance patient-centered care by reorganizing the working space to improve communication and teamwork, as well as extend technology and services. Mount Auburn Hospital is a major affiliate of WorldPath Health and this newly renovated Cancer Care and Hematology Center ensures that WorldPath clients can benefit from the most advanced and innovative care.